The Bogota School District is holding a workshop on how to identify & handle harassment of Students. This is co-host by the New Jersey Child Assault Prevention Project ( NJCAP). This will be held in the Gymnasium of Bixby School starting at 7:00p. This is open to any Parent of all school age Students. A class on Spiritual awareness is being offered by the Dragonfly Healing Center. This is a two day workshop about how to experience a Shamanic Journey. This will take place on Saturday & Sunday 1& 2 March. 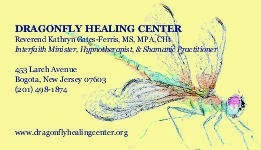 at the Dragonfly Healing Center located at 453 Larch Ave. in Bogota, NJ. This two workshop will cover the basic elements of a Shamanic Journey. The cost of the workshop is $75 per day, anyone wishing to attend must register before Saturday 22-February. For more information, or to register please email : kathy@dragonflyhealingcenter.org or call Kathy Ferris at 862-200-7719.